Snapchat launched in 2011 and gained popularity as a social media messaging app, but made big expansions with additions like stories, which allowed your friends to see your pictures for 24 hours. The app has now transformed itself into one of the social media powerhouses as Snapchat’s parent company, Snap, IPO’d recently with a valuation of $22 billion. Snapchat continues to innovate with features like filters, which adapt to your facial expressions in real time, and the addition of Bitmoji, cartoon characters you design to look like yourself. However, Snapchat is also facing harsher competition than ever. Facebook and Instagram have copied Snapchat’s popular story feature, and Instagram’s story feature already has more users than Snapchat. 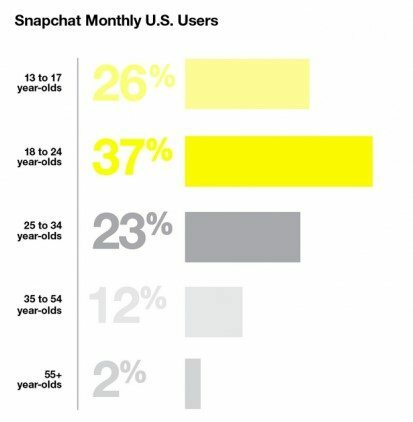 Snapchat has a strong brand reputation and high user engagement amongst its users, but the problem is that 71% of Snapchat’s users are under 34 years old. Snapchat is having a hard time expanding into older audiences keeping the user growth relatively low. Thus, Snapchat does not have the explosive growth Instagram currently has or Facebook once had; however, the users who do use Snapchat are dedicated and highly engaged. Snapchat has recently been a great advertising app for larger businesses, but the company is beginning to transition its advertising scheme to assist smaller businesses. Snapchat recently announced it is adding self-service tools so small businesses can create ads like geofilters, filters that pop up if users use the app in a certain location, and even full screen ads. Like Instagram, advertising on Snapchat is for those who have artistic expertise and excel at making visual ads. However, if your company can do this and is targeting a mostly younger age audience then Snapchat is probably the ideal advertising platform for your business. Snapchat still has some innovating to do so we will see where their advertising goes in the future, but it is evident that Snapchat offers some of the more creative advertising options that could lead to a higher conversion rate. Twitter has been around since 2006 and currently has 328 million monthly users, but the app has seen its growth fall off dramatically over the past 3 years. From 2010-2013 Twitter was one of the fastest growing apps around and it appeared to be the next MySpace or Facebook. Is is not to say that Twitter has stopped growing completely though because in the recent years they have been doing a lot of things right to please their current users and gain new ones. The social media site signed major deals like the one in 2016 to stream Thursday Night Football games and another deal with the WNBA to stream regular season games. The app also acquired the live video streaming company Periscope and the 6 second video app Vine in 2012. However, despite the promise of these deals, none of them worked out as Amazon will now stream Thursday Night Football, Periscope is forced to compete with the more popular Facebook Live, and Vine shut down in 2016 as it failed to draw profits. Twitter did have a 6% user growth in the past year, but the social media site seems to have reached its peak, as people are resistant to sign up and start using the app. To many people, Twitter seems complex and confusing, and it is this stigma that is preventing Twitter from growing as Facebook or Instagram speeds. Yes, Twitter may not be the next big social media app of the future, but this does not mean it is not important for marketing in the present. Twitter’s 328 million monthly users are a massive, attainable audience waiting to be marketed to. Twitter’s users are similar to Snapchat’s in that 37% of users are between the ages of 18 and 29 while 25% are between 30 and 49. This means that Twitter, like Snapchat, should be mostly used by businesses targeting a younger audience. Twitter, like most other social media sites, also offers ad campaigns; however, Twitter is like Facebook in that the ads are more word oriented rather than image oriented like Snapchat and Instagram. The difference between Twitter and Facebook ads are that Twitter ads are more often comical and humorous due to the younger demographics and overall sentiment of the site. Thus, if your company is targeting a younger audience and you believe you can make comical ads that can draw attention from your audience then Twitter may be a good marketing fit for your business. Thank you BZ. Glad you liked it.